Published at October 28, 2005	in and . Closed Tags: No Tags. 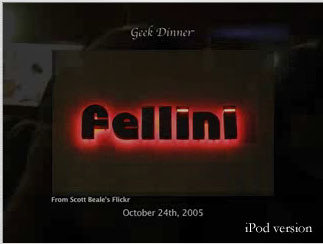 Dave Winer threw a Geek Dinner at Fellini Restaurant in Berkeley for Robert Scoble. It was at the back of the resaurant which was had a few posters and movie stills from the films of one of my favorite filmakers, Federico Fellini. It was a bit crowded since the space for schmoozing was relatively narrow between the tables and bar. But no one seemed to mind much and there was much animated conversation.